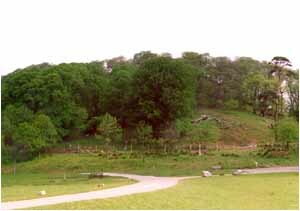 Mynydd y Castell – an iron age hill fort lies north of Magam castle and was once occupied by the Sitares, Celtic people who were defeated by the Romans in 74 AD. It consists of an area of 7 acres, enclosed by a massive defence bank and ditch which can be seen on its east side. Sited at a point where the coastal plain narrows, it would have held an importance strategic position controlled the routeways from the east to Gower and the west.